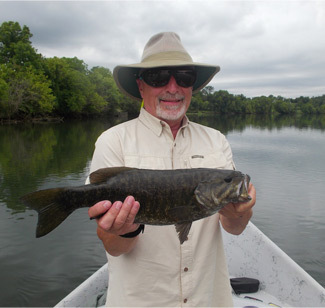 Steve Hall caught this beautiful smallmouth bass on the French Broad River, in July. He was using a white popper. This fish is 18" long. Steve was fishing with guide Josh Pfeiffer. The bass rose to the fly 2 or 3 times as they watched. The bass finally took the fly. I was there that day, fishing from a kayak down river, so I missed the show. I caught this bass late one day while testing a Game Changer fly. This is a female bass that has just spawned. Notice the thin belly. This fly was so heavy, I used a 9 weight outfit. It wore me out. Also, the reel is a very expensive Tibor. I took a chance and didn't drop it overboard. I don't normally use expensive reels on a lake. The rod is a Temple Fork Professional II. You may have noticed, both of the photos above were taken on cloudy days. We always try to choose cloudy days to fish, if possible. Also on lakes, a little chop on the water is beneficial. The bass are more likely to be in shallow water under these conditions and you can get closer to them. Copyright Little River Outfitters, Inc. If you asked 20 different avid smallmouth bass fly fishermen, which fly rods they prefer, you would probably get 20 different answers. Some anglers prefer fast fly rods, stiff sticks that cast big flies in the wind well. 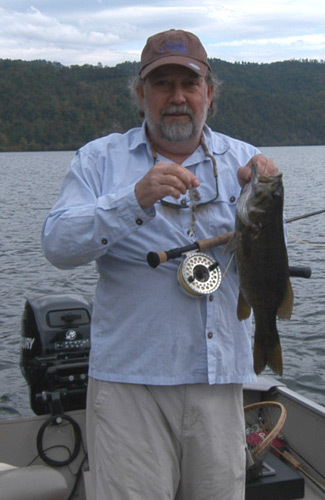 Others are partial to fiberglass fly rod, reminiscent of the days when I started this sport. Fiberglass rods are making a remarkable comeback. I use one too, for bluegill mostly. It’s the same with line weights. Sure, a 7 weight fly rod is probably the most useful. You can cast larger flies with a 7, than you can with a 6 or 5 weight. And, you can cast smaller and lighter flies with the 7 weight too. If I could have only one, for smallmouth bass it would be s 7 weight, 9’, medium-fast fly rod. I use a 7 weight just about every time I fish for smallies. But, my favorite smallmouth bass fly rod is a 9’ 6 weight. I tend to use smaller and lighter flies for smallmouth bass. I like the feel of a 6 weight. But, I do pull out some big flies, cast them on the 7 weight at times, and they do catch big fish, like the old saying goes. I also use an 8 weight at times. When Paula and I are fishing in our motorized fishing boat, we always have a 5 weight rod with us. Sometimes a 5 weight is a lot of fun to use for smallmouth bass. In particular, we sometimes encounter a school of bass, attacking minnows in the middle of the lake. The water is deep. We use small, 1 ½ inch long threadfin shad patterns. That rod in our boat always has a Puglisi Threadfin Shad tied on. We have both caught a lot of smallmouth bass using a 5 weight fly rod. If I am drifting down a river with a guide, I always take a 6 and 7 weight. If I’m alone in my kayak, fishing for smallmouth bass, I always seem to choose the 6 weight. If I am wade fishing, I usually choose the 6 weight. We have a wonderful smallmouth bass river, 5 minutes away from our home, called Little River. We keep all of our smallmouth bass rods lined up and ready to go. When I fish Little River, I always grab the 6 weight, my sling pack, waders and go. All of my smallmouth fly rods are 4 piece, and made from graphite. They are all 9 feet long. They all have a medium-fast to fast action. So, in closing, I will make it clear, my favorite rod is a 6 weight, and I use it as often as I can. Next is the 7 weight. I’ve caught a lot of big bass on a 7. I love reels and have some really nice ones. But, lets face it, for smallmouth bass, a hand made reel, with cork drags and a price tag to match is overkill for smallmouth bass. And, let’s be practical. We may be fishing in deep lakes or rivers, in boats. I can’t stand the thought of dropping a expensive reel and rod overboard, never to be seen again. Believe me, it happens. So, all of my smallmouth bass outfits have mid-priced Orvis reels, with a sealed disk drag and they are all mid-arbor reels. Most of ours are the Orvis Access mid-arbor reels. For the money, they can’t be beat. You can buy Waterworks-Lamson, or Ross Reels in the same price range and they perform just as well. I would definitely have a reel with the capacity for plenty of backing. You may not need a lot of backing for smallmouth bass, but if you do hook a huge carp, you will. Make sure your reel is saltwater safe, especially for a 7 weight. You may have the opportunity to use your outfit for saltwater fishing. Most new moderately priced reels are saltwater safe these days. By the way, I am right handed, I cast with my right hand and I reel with my right hand. When I began fly fishing in 1962, every reel I saw was made for right hand retrieve and they were not reversible like they are now. Make sure your fly shop sets the reel up for your preference. Most fly fishermen reel with their left hand. I don’t know why. I like a fly line with a short heavy head for smallmouth bass fishing. That design helps when I cast heavy flies. I also use a floating, weight forward fly line, 90% or more of the time. Most modern fly line companies make specific bass fly lines. Some even have smallmouth bass fly lines. Fly line brands are a personal choice in my opinion. For instance, all of my saltwater fly lines are the Orvis brand. My trout lines are either Scientific Anglers or Rio. For now, my favorite smallmouth bass line is the Rio Smallmouth Bass line. We sell several major brands of fly fishing tackle at Little River Outfitters. If you are partial to a particular brand, like Sage, Temple Fork, Orvis, Winston, or others, pick the rod you prefer in the brand you like. Being practical, and thoughtful of the fact I may drop an outfit overboard, I assembled the smallmouth outfits I use on the lower end of the price scale for my use. All of my smallmouth bass fly rods are made by Temple Fork. They perform well, and they don’t cost an arm and a leg. The same is true for reels. All of my outfits have mid-priced reels, Orvis mid-arbor reels to be specific. I would not go cheap on the fly line, never. I’ve made that mistake. I use the Rio Smallmouth Bass fly line on my outfits. I try to keep this simple. I use monofilament leaders for top water fishing because mono does not sink as fast or as deep as fluorocarbon. I use fluorocarbon when fishing below the surface because, this material is denser, and has greater abrasion resistance. They say fluorocarbon is also less visible to fish. I always use 9’ extruded and tapered leaders. If I need a shorter leader, for a very heavy fly, I may shorten the leader, by cutting some material from each end. The leaders I use are either 2X or 3X in mono, and 8 pound or 12 pound test in fluorocarbon. I always tie on my flies using a non-slip loop knot, so the flies have more action in the water. I use Orvis leaders and tippet and have for at least 30 years. I’ve never found a reason to change, so I haven’t. Other companies make excellent leaders and tippet. We sell several brands. I put together some balanced outfits, just like mine on our online store, just to make it easy for you if you are in the market for a very good new outfit that doesn’t break the bank. Click the "More Info" Button below. There are four. Two have my favorite Temple Fork fly rod, the lightweight BVK in 6 and 7 weight. The others cost about $100 less and feature the Temple Fork Professional II fly rods. I prefer the BVK, but to me, they both cast about the same. The BVK is lighter. Most of the fly rods my wife and I use for smallmouth bass are the lower priced Professional II. My favorite 6 weight is the BVK. You can see these combos, and order one if you like by clicking the link below. That will take you to a category, in our online store, specific to smallmouth bass fly fishing, and it features only the tackle, gear and flies I personally use and recommend. We do not charge for ground shipping. We will rig it for you.